The verdict's in on the season two premiere of HBO's The Newsroom, and if it isn't unanimous it ought to be. It was good, very good, if not downright terrific (which I personally think it was). Most early reviews seem to say so, one way or another—some more straight out than others. These include the reviews of some writers who last season were either picky, or even dismissive of, a show that started out strong and got better as it went along and was, by any objective analysis, one of the best dramas on television—if not the best of the lot, cable or standard broadcast. One of the more difficult things to do in the wake of a successful first-season television series is to make the second season even better. The Newsroom got off to the kind of start Sunday night that promises to do just that. A strong new story arc made it so: As the NewsNight staff is gearing up to cover Election Night 2012, it is also being prepared to give depositions in a lawsuit about a story that proved to be wrong. This lawsuit is a thread that will be woven through the season's episodes. The sparkling acting of Jeff Daniels (as anchorman Will McAvoy) and Emily Mortimer (as his executive producer MacKenzie McHale) together with the masterful writing of Aaron Sorkin kept the dialogue crisp and the story-line moving interestingly. A well-chosen supporting cast, including some newcomers, helped. One of the best things about The Newsroom is its authenticity. This is what impressed me so much last season, and if this first season two installment is any indication, it will be just as good this summer—if not even better. The show is fiction, but this is the way news organizations and newsrooms work. This is the way most television journalists talk, think, work and live. These are the kinds of challenges and pressures they face, the weaknesses and strengths they have, and the mistakes they sometimes make. 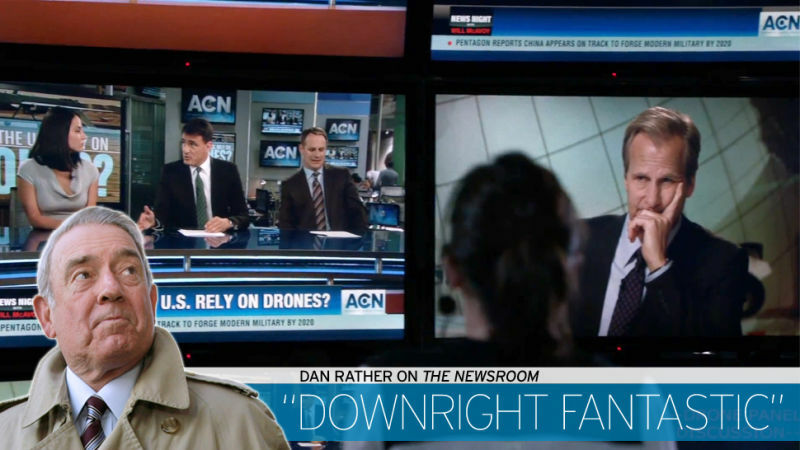 The Newsroom is entertainment, and as entertainment it's as good or better than anything you're likely to experience these days anywhere on TV or at the movies. But it is also entertainment with a high quotient of information and education about how big-time TV news really works and why integrity-filled, high-quality news is important in a constitutional republic based on the principles of freedom and democracy such as ours. Running through the hours of this series is a reminder that a free press—a truly independent, fiercely independent (when necessary) press—is the red-beating heart of democracy. Also a reminder of how corporate and government manipulations—and the trivialization of the news—are constant and growing threats, whether the news organizations are traditional print or electronic. In short, The Newsroom is not only entertaining, it's important. Some reviewers and no doubt some in the audience didn't seem to get this during the series first run. I think there are early signs in the beginning of the second run that this may be changing. (Yes, I admit, hope may be father to the belief). Once into the actual episode, I thought it started a little slow. But Jane Fonda (as the corporate chieftain of the company that owns the network) and Sam Waterston (as the news division president) jump-started it as soon as they appeared, which was pretty quickly. Fonda and Waterson helped carry the program all of last season. Based on their first appearances this season there is no reason to believe they won't again. When I speak of the show's authenticity, they are big part of that. I've seen my share of corporate TV titans and news division presidents in my time and, trust me, Fonda and Waterson play these roles to perfection. Trouble is, in real life and in the real world of big-time television news, there have been, and are, too few of them with the intelligence and good intentions displayed by the characters played by Fonda and Waterson. (Well, for that matter, fair to say that there have been, and are, too few anchors and executive producers with the smarts and good intentions displayed by the characters played by Daniels and Mortimer. But there are some—more than you might think). Anyway, The Newsroom as a workplace is a fantasy. But know this: There always has been and is still more idealism than cynicism, more decency and good intentions among television journalists than for which they are sometimes given credit. The control room scenes were especially authentic, including depictions of control room "glitches." How the news team handled stories such as Libya's uprising had the real "feel" of how breaking news actually gets covered. When the anchorman is pulled from 9/11 anniversary coverage, Daniels is great at conveying the inner disappointment and turmoil of an anchor under pressure and accepting setback—The Agony of the Anchor. I've been there, every anchor has at one time or another, and trust me: Daniels played this bit perfectly. (I know, I know, you doubt that what you see as [and what may be] overpaid and over-praised anchor-people ever experience anywhere near what many people do in terms of "agony." So be it. Maybe you're right. But when you're in the anchor chair and—rightly or wrongly—you have to face the furnace and take the heat it, sure feels like agony of at least a sort). The scenes about whether the U.S. should use more drones had the "real feel" of newsroom discussions and were good examples of the timeliness and relevancy of much of this series installment. Ditto the scenes about "Occupy Wall Street" coverage. Once again, here as elsewhere, the combination of an ideal anchor, executive producer, and news division president—all in one place, at one network, at one time—reminds us that this is fiction. It has happened in the real television news sometimes in the past—may be happening somewhere now. But it hasn't happened—doesn't happen—often. Certainly not often enough. • As with earlier installments in the first season, the dialogue and important nuances in the story can be a little difficult to follow. This is a show where one has to listen closely and pay attention as plots and sub-plots develop. • The opening has been changed from last season. I didn't think it was any better, but it was good (full disclosure: since your writer was seen briefly in last season's opening montage, he may be biased toward it). Well, enough already. The new The Newsroom has an exceptionally strong narrative arc, multi-layered plot lines, excellent dialogue—including dialogue that consistently moves the narrative—and some of the best writing and acting you will experience on television this summer. Last season "The Newsroom" was a stone-cold winner. If they can keep up what they accomplished in the launch of this season, it will be again—nay-sayers, nit-pickers and jealous competitors notwithstanding. Executive Producers Aaron Sorkin, Scott Rudin and Alan Poul are off to a good start. Dan Rather is anchor and managing editor of Dan Rather Reports. You can follow him on Facebook and Twitter. He will be recapping each episode of the second season of HBO's The Newsroom.